Following a critically acclaimed run at Vault Festival and a UK tour, Tatty Hennessy’s ‘warm, witty and wonderful’ (The Stage ) A Hundred Words for Snow transfers to Trafalgar Studios for a limited run, directed by Lucy Jane Atkinson (The Stage’s ‘Top talent to watch’) and performed by Gemma Barnett (Goggles, Roosting). 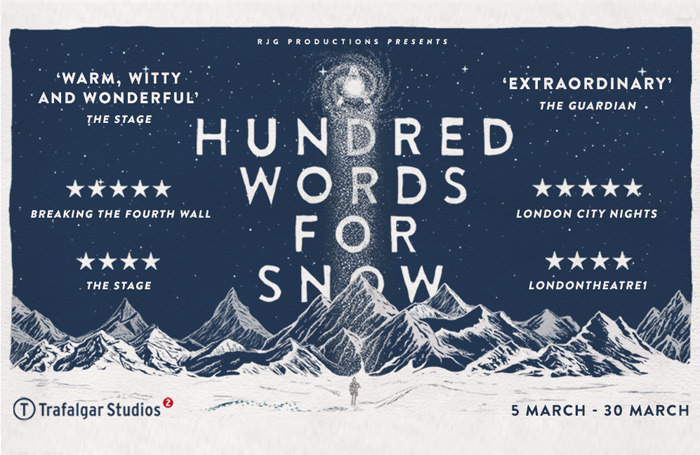 To win a pair of tickets to see A Hundred Words for Snow at Trafalgar Studios, London, go to thestage.co.uk/competitions  and enter your details and put SNOW in the code box. Entries close at midnight on January 1. Terms and conditions: Subject to availability. Not to be used in conjunction with any other offer and no alternative offered. Travel not included. Non transferable. No cash alternative. By entering the competition you agree to your contact details being passed securely to a third party who will only use them for the purpose of this competition and to your name being published in The Stage newspaper.